D Nicknamed "The Big Island", Hawaii was born from fire & ice, it's the largest and youngest island in the Hawaiian chain. Are you ready for one of a kind adventures? If conditions are right, you can surf & snowboard the same day! Or, for the rest of us, take a walk on a beautiful black sand beach, wander through lush rain forests, bird-watch while hiking to exotic waterfalls. Topping my list of unforgettable memories is night diving with Manta rays. Or, (cautiously) in pursuit of Kilauea & its fire- breathing lava flows to the sea. Hawaii’s Kilauea volcano has been a hotbed of explosive activity since early May 2018, gushing lava & toxic gases have destroyed many homes and forced thousands of residents to flee. Big Island Activities ~ Low Price Guarantee! Although, The big island is massive, it’s remarkable for more than just its size. There is the popular and Historic town of Kailua-Kona a vibrant town known for it's shopping, entertainment & its diverse and local food options.. And Hilo, the wettest city in the United States, averaging over 100 inches annually, definitely worth visiting. Hilo is home to world renowned botanical gardens, fertile rain-forests, and nearby dramatic waterfalls, plus, off-the-beaten-path local shopping and restaurants. Not only does the Big Island have black sand beaches, it also has a remarkable green sand beach where the sand is made up of olivine crystals weathered out of a cinder cone. 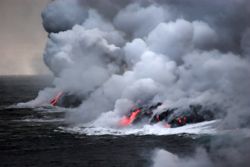 A must-see for any first-time visitor is Hawaii Volcanoes National Park, home to "the world's only drive-in volcano." But alas, most wonders of the world involve preparation and legwork., To get the best view of Lava Flow and get to the Green Sand Beach, hiking is required. You'll enjoy trying to answer the age old question, is it more about the journey or the destination? The slopes of Mauna Kea “white mountain” can be an adrenaline-seeking ski-able/board-able dream. There are no ski lifts, no grooming, no resorts. You'll need a 4-wheel drive vehicle and designated driver to take you to the summit and pick you up at the bottom of the run. It’s not a trip for beginners, If you run out of snow at the bottom, Mauna Kea never runs low on jagged lava rock. Backpacking The Big Island of Hawaii! Our friends at alltherooms.com put together a list of a few must-do things on Hawaii that are waiting to say ‘Aloha’ to backpackers. Here you will find affordable Big Island hostels, campgrounds and local food (grinds) sure to give you the incredible flavor of the The Big Island. Locals know: local favorite for breakfast, said to be around since 1940’s The heart stopping Loco Moco, it's is where a pool of gravy gushes down a fried egg, stacked on a thick hamburger patty, that sits on a large bed of white sticky rice. Know that the portion size is usually enough for 2 people. Another local favorite for breakfast is Saimin noodles and desired condiments, such as strips of scrambled egg or slices of roast pork or luncheon meat. Or, try the ole’ standby of spam, rice and eggs. The big island provides an opportunity to try the freshest, best tasting produce and vegetables you may ever sink your teeth into.At the same time, you'll be supporting the local community by shopping at the farmer's market and local KTA grocery stores. Some of my personal favorites are dragon fruit, lychee, jabong’s. A must eat are the sweetest apple bananas you will ever have, mango's, papayas too. Any trip to the big island must include a visit to the Big Island Candy company.Melt in your mouth melt chocolate and cookie deliciousness. And hidden along the coastline north of Kailua-Kona you'll discover the harder to find soft white sand beaches like Makalawena beach. What you should know….Most visitors arrive at Kona International Airport, but Hilo International Airport is closer to Hawaii Volcanoes National Park. If you're staying in Kona and you plan to visit Hawaii Volcanoes National Park, consider staying in Hilo, Puna or the Volcano area for a night since a one-day round trip will not give you enough time to explore the park. When venturing out, prepare for the terrain and temperature, pack sunscreen and plenty of water & snacks. Bring a headlamp, when all you see are stars, you’ll be glad you did..